Aggressive Sale Price! This home has it all for entertaining & just enjoying life at home! Lovely colonial with open floor plan, custom eat-in kitchen w/granite counters, large center island & commercial grade appliances and french door access right out to the pool! The large vaulted family room w/two story windows has a dry beverage bar, perfect for entertaining. The formal dining room w/tray ceiling and living rooms with beautiful transom windows, let's the morning sun in. The large first floor office with walk-in closet has many windows for the days you work from home. The laundry/mud room w/closet has garage access and pool access to the backyard pool, perfect for managing the pool towels. The second floor large master bedroom suite w/sitting room, a perfect spot to retreat to, boasts a gas fireplace, two walk-in closets and an over sized master bath with spa tub, two large sink vanities, stall shower and water closet. There are an three other additional nice size bedrooms, one has it's own en-suite full bath with tub/shower combination, the other two bedrooms share a full hall bath with tub/shower combination located between them. The lower level finished walk out family/recreation room has an area for a pool table or media-sitting room and an exercise area. The outside back yard has a beautiful in-ground heated gunite pool w/spa. The pool has a pebble tech, ocean blue finish. The home comes w/8000-W home propane generator., Aggressive Sale Price! 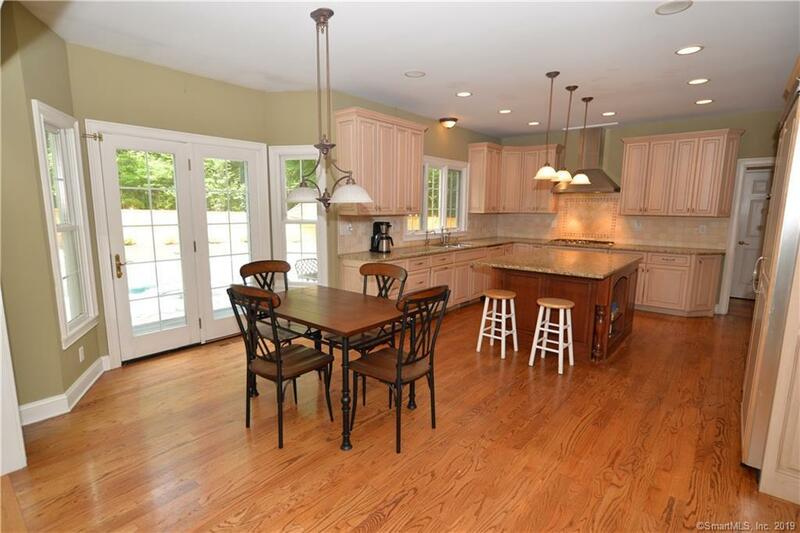 Beautiful colonial that has it all for entertaining & just enjoying life at home! This lovely colonial has an open floor plan, custom eat-in kitchen w/granite counters, large center island & commercial grade appliances and french door access right out to the pool! The large vaulted family room w/two story windows has a dry beverage bar, perfect for entertaining. The formal dining room w/tray ceiling and living rooms with beautiful transom windows, let's the morning sun in. The large first floor office with walk-in closet has many windows for the days you work from home. The laundry/mud room w/closet has garage access and pool access to the backyard pool, perfect for managing the pool towels. The second floor large master bedroom suite w/sitting room, a perfect spot to retreat to, boasts a gas fireplace, two walk-in closets and an over sized master bath with spa tub, two large sink vanities, stall shower and water closet. There are an three other additional nice size bedrooms, one has it's own en-suite full bath with tub/shower combination, the other two bedrooms share a full hall bath with tub/shower combination located between them. The lower level finished walk out family/recreation room has an area for a pool table or media-sitting room and an exercise area. The outside back yard has a beautiful in-ground heated gunite pool w/spa. The pool has a pebble tech, ocean blue finish, surrounded by a concrete patio that repels heat. The home comes with an 8000-W home propane generator. Directions: Toddy Hill To Marlin, Or: Route 25 To Botsford Hill Rd, Rt On High Bridge Rd, Lt On New Lebbon Rd, Lt On Marlin.